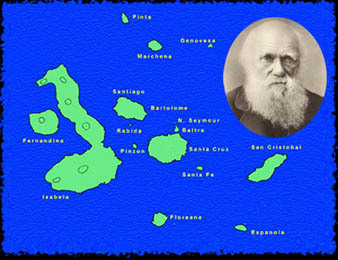 Of the three, Oceanites is a southern form while Oceanodroma is a northern form. Both the white-vented storm petrel and the wedge-rumped storm petrel are endemic Galapagos subspecies. Other species of storm petrels have occasionally been reported as vagrants. Storm petrels are not often easy to identify because of their very small size (6-8 inches), rapid movements, and generally great distances from the observer. 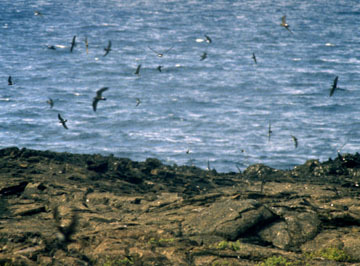 The white-vented storm petrel, which is the species in the photographs to the left, are the most commonly sighted inshore species. It is part of the southern grouping of genera and, typical to that group, it has very long legs which project behind the tail. In Galapagos, it is the only storm petrel with this feature. All three Galapagos storm petrels have a white patch on their rump. The narrowest is the band-rumped while the largest is the wedge-rumped, in which the patch is strongly triangular and the point extends deeply into the tail.In the White-vented storm petrel, the band wraps around the belly, as can be best seen in the middle photograph. Also a distinguishing feature of the white-vented storm petrel is its squared-off tail. All three storm petrels, like storm petrels everywhere have their nostrils fused into a single tube on the top of their beak. Despite the fact that the white-vented storm petrel is a resident, endemic subspecies, its breeding sites have never been found. Autopsies of dead birds suggest that they lay their eggs from April to September. The other two species, both Oceanodroma, have well established breeding areas. One well known site is on the cliffs above Prince Philip's Steps on Genovesa. There, the birds nest in the numerous lava tubes and cracks that riddle the ground. The birds fly rapidly back and forth, seeming more like a swarm of insects than a flock of birds. The wedge-rumped storm petrel is the only one to visit its breeding site during the day, feeding by night. Thus, any day-time siting of a feeding storm petrel will most likely not be the wedge-rumped. The wedge-rumped petrel breeds from April to October, laying one egg that is incubated by both parents. The band-rumped petrel likewise lays a single egg, but breeds in two groups, one from February to October, and the other from October to May. Like other storm petrels, and unlike its neighbor, the wedge-rumped, it feeds during the day, usually farther out to sea than the white-vented storm petrel, and returns to its nest at night.